Somerville Hino has been in business for over 60 years. As a long-standing commercial truck dealership, they understand how important it is to evolve and adapt to meet consumer demands. Located in Greater Toronto with a population of over six million, Somerville Hino is one of many dealers in a very competitive region. They knew that expanding their digital presence was going to be the best way to capture more brand visibility and increase website traffic, but needed a partner to help them strategize and execute. Here’s how we helped them see high double and triple digit increases for their online presence. Prior to partnering with FlexDealer, Somerville Hino was working with another provider. After 18-months of lackluster results and little transparency, they switched to FlexDealer to help breathe life into their digital efforts. The switch came with four main goals. Increase brand awareness in the Greater Toronto Area. Increase website traffic & rank higher in Google search results. Collaborative strategy creation & transparent reporting. Of consumers compared products, prices, and features online. Of consumers use search engines to research products. 17% use online retailer websites. Looked for opinions, reviews, and advice online. From a sales perspective, the market certainly seems competitive. From the perspective of making the consumer journey as easy and informative as possible, not so much. After listening to Somerville’s objectives and getting to know their ideal audience, we crafted an awesome strategy, not so much. Similar to other buying segments, commercial vehicle consumers conduct research online to help them make a purchase decision. Commercial Truck Shoppers don’t purchase because they want to. They are often a business purchase; something that is necessary to keep their business running smoothly. Working closely with the team at Somerville Hino, we re-designed their website user experience with the target audience in mind. With a high number of consumers looking for opinions, reviews, and model information, we determined that a consistent delivery of new model pages, blog posts, landing pages, and social media assets would help them drive more traffic and generate buzz around their brand in the region. Our focus was on creating a long-term search engine and referral traffic strategy by increasing the relevancy of the information on Somerville’s website. "FlexDealer finds dynamic solutions to sometimes complex projects. The weekly support call helps us maintain and excel our website." 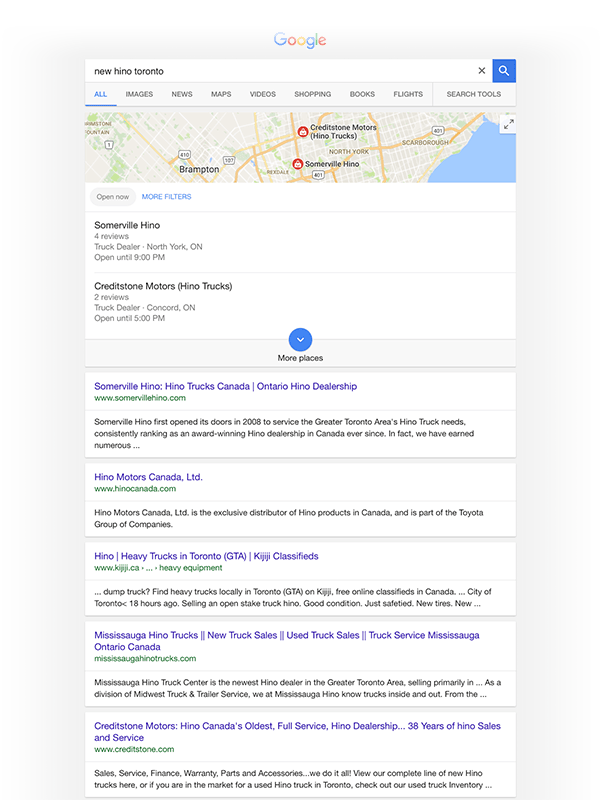 Somerville Hino wanted to increase traffic to their website and increase brand awareness in the GTA. By aligning their business objectives with consumer demand, and by increasing the usefulness of their website, Somerville Hino began to dominate first page ranking. In fact, they outrank manufacturers and other national websites for some very competitive search terms. Google’s mission is to make the world’s information more accessible. As such, our content strategy helped increases the relevancy of Somerville’s website over the competition. Not only did Somerville rank on the first page of Google for competitive search terms, they managed to see double and triple-digit increases in organic traffic to their website. Inside of one year, Somerville achieved a 37.2% increase in Leads. "From content, graphics, and PPC to brainstorming on marketing campaigns, FlexDealer has been a true partner!" Let’s talk about your marketing! Discover the biggest opportunities to grow your dealership and dominate online!